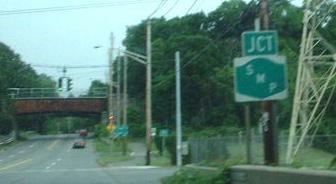 New York Roads - Saw Mill River Pkwy. White on green, looking keen. Green on white, what a blight! Get it right, or I'll be mean! No problems here in 1976. Courtesy Michael Summa. 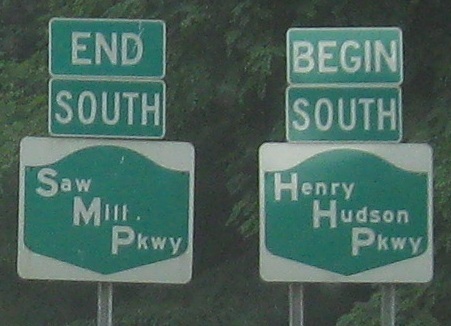 The first two signs are still on the very northern tip of Henry Hudson Parkway, which up till Exit 23B was NY 9A. Contractor tried to get a little fancy on that second one, or maybe forgot he hit Control-U. The two parkways... oops... The two parkways, Henry Hudson and Saw Mill River, change over at the Bronx/Yonkers line, and ought to just be one name. 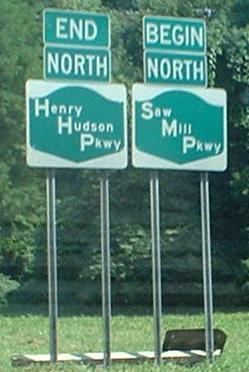 The southbound end of the Saw Mill into the beginning of the Henry Hudson. NB and SB under McLean Ave., SB Exit 3 and the last exit before the Henry Hudson Parkway. So wait, where are Exits 1 and 2? The same place as Exits 8, 41 and 42, and a bunch of others. The Parkway exits must have been numbered by a bunch of drunken nuns. This is the beginning of Cross County Parkway, and you're still several miles from the "Hutch" (as it's endearingly known). Southbound button copy and the trainwreck that replaced it. Lockwood Ave. EB and looking back west under the Saw Mill River Pkwy. NB bridge at Exit 6. This is obviously the original 2-way bridge carrying the entire Parkway, and the modern SB one was built much later when capacity was increased from 4 lanes to 6 lanes. 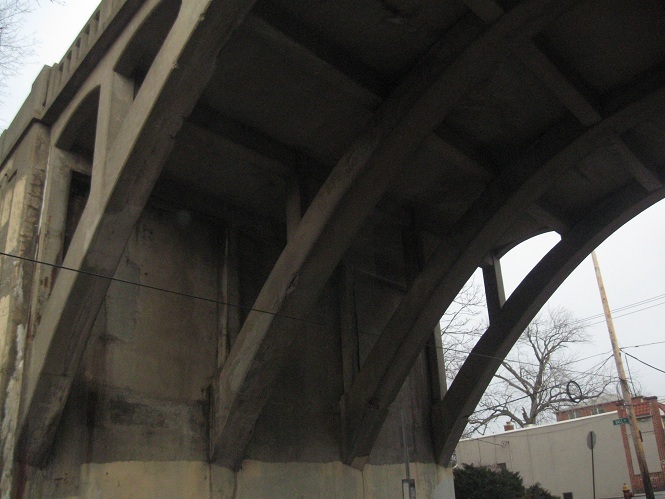 One more bridge, Odell Ave. facing SB. It's Exit 8, but only NB, thanks to a confusingly archaic system of ramps laid out in the Depression era. 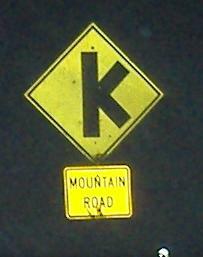 This side-road stick sign doesn't belong on a freeway. It's trying to describe a southbound weave. Courtesy Doug Kerr, the contractor got lazy. 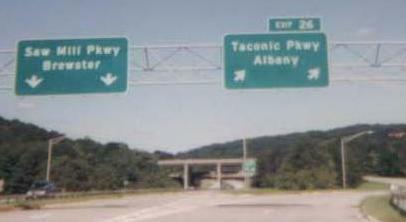 Maybe the same guy went over to Taconic State Parkway and turned it into a teaspoon (TSP). Usually, the words "River" and "State" are each dropped, so I don't know why it stayed in in the Taconic case. Or maybe it's worse to drive on Toilet Paper. NB, courtesy Doug Kerr - the Taconic doesn't begin here, but this is a major traffic split, as traffic from the heart of New York City decides whether to head upstate or toward Connecticut. Can you believe this interchange was once a traffic circle?? (There was much less traffic in the 1930s-40s.) And now you see what I mean by "River" and "State" disappearing on most signs. 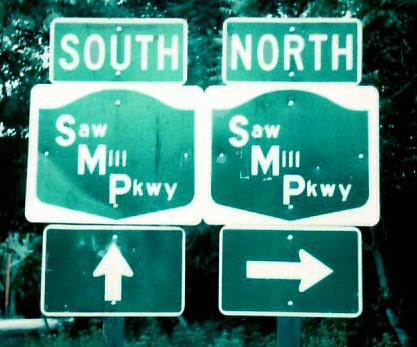 What happens here is that due to the proximity of Exits 5 (Saw Mill) and 6 on I-684, the Saw Mill sets itself up as a C-D road to I-684. NB Exit 6 traffic from 684 has already left the mainline and joined NB Saw Mill traffic in the second photo. The same location in 1970, courtesy Michael Summa. Technically, to the north was just NY 22 for a few miles, not I-684. 22 had been four-laned on what became the I-684 right-of-way (since it was originally the 22 ROW), but it took until 1974 to complete the freeway and the frontage road that is now 22. 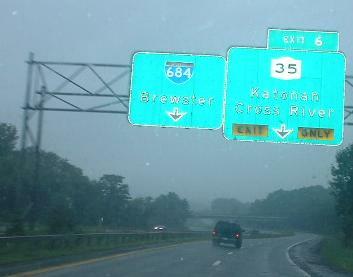 This photo is still on the I-684 southbound C-D road, but it's also technically on Saw Mill River Parkway southbound. The one just before it, in the same situation, is on the I-684 page.